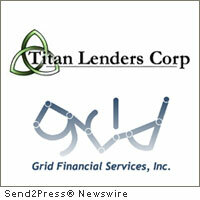 DENVER, Colo., Feb. 24 (SEND2PRESS NEWSWIRE) — Titan Lenders Corp (TLC), a U.S.-based domestic mortgage fulfillment outsource operation, and Grid Financial Services, Inc. (Grid Financial), a U.S.-based domestic business process outsource provider for loan processing, underwriting, and default services, have created a full service best practices loan fulfillment service that will allow mortgage lenders to accelerate market entry, reduce overhead, and establish credibility with mission critical partners. The comprehensive loan fulfillment service offers lenders a parallel and variable cost alternative solution to a fixed overhead operation. It will provide a consolidated automation platform and best practices expertise for mortgage lenders, picking up the loan file as soon as the loan officer completes an application. The TLC-Grid Financial platform will handle disclosures, processing, underwriting, closing, post-closing through final sale to investors. Completely represented and warranted from the closing perspective, the TLC-Grid Financial service is focused on compliance, transparency, salability, and accountability. Titan Lenders Corp’s patented, proprietary web-based software Cerberyx (CBX) supports a full suite of fulfillment services, including: funding, compliance, closing, post-closing, purchase review for correspondents and warehouse lenders, trailing documents, MERs management, FHA insuring, and document management (imaging). CBX’s flexible rules-based architecture allows TLC clients to define field level decision trees, priorities, checklists and process management specific to an investor product variance or a cross-investor climate. Titan Lenders Corp (www.TitanLendersCorp.com) is one of a specialized few providers of mortgage back office fulfillment services, a not-well-understood facet of mortgage lending that includes closing, funding, and post closing services. Community banks, credit unions, mortgage bankers and brokers, and warehouse line lenders use outsource providers strategically to minimize compliance risks in a time-sensitive error-averse environment. Fluctuations in mortgage lending volume also lead some mortgage lenders to outsource their entire back office operation and secure predictable “per transaction” pricing rather than maintaining an inflexible static in house staff. TLC is a preferred provider for some of the nation’s largest mortgage bankers and warehouse lenders. Grid Financial Services, Inc. (www.gridfinancialservices.com) is a Business Process Outsource company located in Raleigh, NC. Grid Financial has a national footprint servicing numerous banks, private equity firms, mortgage origination platforms and servicing companies. On the loan origination side of our business, Grid Financial provides outsourced loan processing, underwriting and closing services. In addition, Grid Financial is your outsourced default services department, providing full Home Affordable Modification Program (HAMP) and non-HAMP modifications, short sales, deeds-in-lieu and all other default services. Grid Financial’s clients range from community banks and mortgage companies to clients ranked nationally in the Top 10. Original Keywords: Titan Lenders Corp, Grid Financial Services Inc, best practices mortgage fulfillment, loan processing outsource, reduce lender overhead, Mary Kladde, Michael Paul, Cerberyx, eSys Titan Lenders Corp Denver Colorado DENVER, Colo.
REFERENCES: Alliances and Partnerships News, Titan Lenders Corp, Grid Financial Services Inc, best practices mortgage fulfillment, loan processing outsource, reduce lender overhead, Mary Kladde, Michael Paul, Cerberyx, eSys Titan Lenders Corp Denver Colorado DENVER, Colo.